This topic contains 8 replies, has 4 voices, and was last updated by Paul 4 weeks, 1 day ago. Is there something that needs to be considered during the update? I did a ftp upload of the extracted zip file and renamed the old theme directory beforehand. In the theme overview of admin the new version is visible and active. Anything else? The same at my site! Galleries also were broken through the update as well. Any help before posting on the ThemeForest site? Same problem as above. #half tag is there on the gallery but its all in single row. This reply was modified 1 month ago by bnjmn. From what I can see, you did install the ‘Mauer Stills Gallery’ plugin, however you did not install the new version of the theme — Stills 1.2. 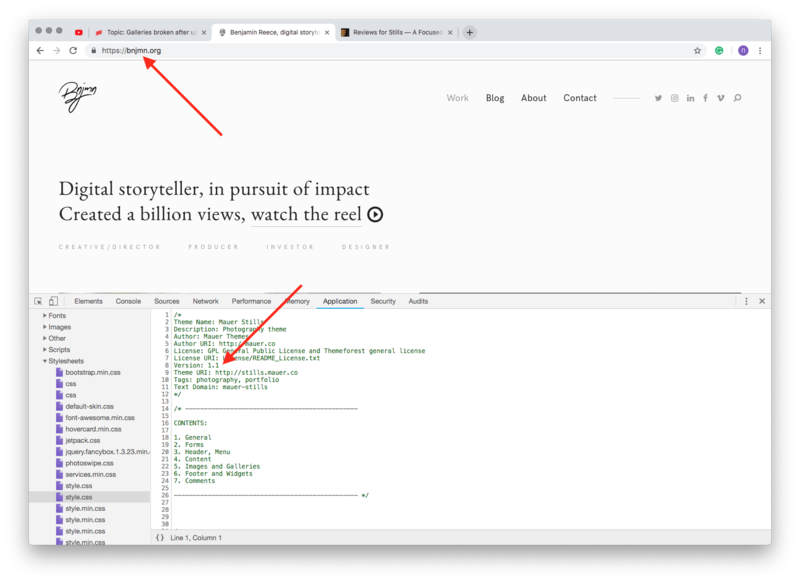 Your website is currently running Stills 1.1 — see proof. This leads to the absense of the gallery styles, which messes up the layout. 1. In your Admin Panel go to ‘Appearance’ > ‘Themes’, click the theme thumbnail and see what version it says you are running. 2. Update the theme to 1.2, if the previous step showed you were running 1.1. During the update, please update the bundled plugins (e.g. ACF Pro). 3. If step one showed you were running 1.2: if you use any caching (plugins, Cloudflare, etc. ), purge the caches and see if the issue persists. Please follow up here when you perform these actions. It looks like you you did not install the ‘Mauer Stills Gallery’ plugin. Please do the following: go to ‘Appearance’ > ‘Themes’, and activate some other theme, then activate Stills back. After that, there will be a message at the top offering you to install the required ‘Mauer Stills Gallery’ plugin. Please install and activate it. BTW, the galleries are now compatible with Gutenberg: try the “Stills Gallery” Gutenberg block. To ensure proper work of the galleries, please make sure you both updated the theme and installed and activated the ‘Mauer Stills Gallery’ plugin. If you’re still having troubles, please post the url of your website, and I will take a look at what can be wrong. I am sorry for the late replies. There has been a family situation. I am back at work now and will provide responses much faster. galleries work fine for now, I fixed the problem. I have only the problem with Mansory layout as mentioned in other thread. Jakub, please see my reply in the Masonry thread.